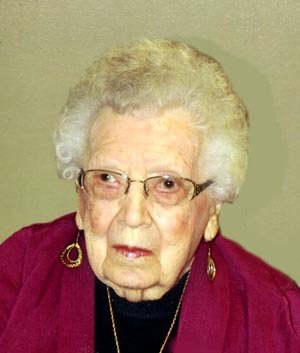 Camilla George, age 100, of Aurora, passed away Wednesday, August 15, 2018, at Memorial Community Care. Funeral Services will be held at 10:30 A.M., Saturday, August 18th at the Aurora United Methodist Church. Rev. Michelle Reed will officiate. Interment will be in the Aurora Cemetery. Visitation will be from 5 – 7 P.M. Friday at the Aurora United Methodist Church, 1104 A Street. Memorials may be made in care of the Aurora United Methodist Church or the Plainsman Museum. Higby-McQuiston Mortuary is in charge of arrangements. Condolences may be e-mailed to the family through the mortuary website at www.higbymortuary.com. Camilla Marie George, the daughter of Mabel (Zigler) and Glenn Lewis, was born on June 23, 1918. Camilla was a lifelong Hamilton county resident. Camilla attended school at the East Ward in Aurora and later when the family moved near Hampton she attended District 8 and then east of Hampton where she attended District 40. She graduated from Hampton High School in 1936. Camilla was united in marriage to Willis George on New Year’s Eve 1936. They settled on a farm two miles east of Aurora. In 1949 they moved to a farm one half mile east and one mile south of Aurora. In 2000, Camilla moved to a home in Aurora where she resided until 2016, when she moved to Memorial Community Care. Camilla’s life was devoted to her family. She helped with the farming and dairy operation. She and Willis had four children: Harriet, Willis Eugene, Evelyn and Bethel. She was involved in several activities in the community. She was a lifetime member of the United Methodist Church, where she taught Sunday school and served on numerous committees. She was chairman of the work groups for several years. Camilla also was a charter member of the Memorial Hospital Auxiliary. Camilla was a 4-H leader and served on the Hamilton County Extension Board. She served on the Plainsman Museum Board for 13 years and also was a long time museum volunteer. Camilla also belonged to a women’s dairy promotional group called ADA-ettes. She is survived by her son, Willis Eugene George and friend Shari Burling of Aurora; three daughters, Harriett (Mike) Barron of Aurora, Evelyn (John) May of Hampton and Bethel George of Aurora; 10 grandchildren, Brenda (Bob) Chop, Barbra (Scott) Mikkelsen, Bertina (Jeff) Carlson, Christie (Jay) Schulze, Matthew (Rachel) George, Sara (John) Laird, Thomas (Kaiti) George, Daniel (Suzanne) May, David May and friend Janet Miller, Karina (Herb) Hasenkamp and 27 great-grandchildren. She is also survived by sister-in-law, Barbara Lewis Ortegren and many nieces and nephews. She was preceded in death by her parents; husband, Willis in 1984 and 4 infant grandchildren. Also preceded in death by her brother, Robert Lewis and sister, Nettie Ellen Peitsch; sister-in-law, Maxine Lewis; brother-in-law, Kenneth Peitsch; daughter-in-law, Joanne (Novotny) George, niece, Kim Lewis Bellinger and nephew, Michael Lewis.